Locals want this type of sign found at Mission Bay Park for Sunset Cliffs Natural Park. Sunset Cliffs Natural Park – the area along and at the end of Sunset Cliffs Blvd, is a Regional Park, but also a City of San Diego Park and a Beach Park. Why does any of this make a difference? For a lot of reasons, but a big one is DOGS. Not only in the city of San Diego, but all over San Diego County, dogs in public must be on a leash. This is the San Diego County Code. For freedom-for-dog advocates, city of San Diego beaches present an entirely different philosophy. Leashed dogs are allowed after 6 p.m. from April 1st to October 31st or after 4:00 p.m. from November 1st to March 31st and on the beach, on sidewalks, and on park areas near the beach during the night and early morning hours until 9 a.m. This if course means NO dogs between 9:00 am and 4:00 pm ever, and 9:00 am and 6:00 pm in the summer. These are not leash-free areas, these are dog-free during most daylight hours. Sunset Cliffs Natural Park is a designated Beach Park. This makes a big difference where dogs are concerned. What is a hapless dog owner to do? Well, one thing they do in Sunset Cliffs Natural Park is to ignore the law. People bring their dogs to the park in droves, and since they are ignoring the law anyhow, they might as well ignore the leash law, which they do. This motion stirred a variety of reactions – both from dog owners and dog lovers, and those who feared retaliation to our native plantings, already subject to vandalism, if the council indeed pushed enforcing the law. Ultimately, the motion failed. Nine voted to table the action pending further investigation, seven were opposed (probably meaning they were in favor of the motion), and 2 abstained. Previous discussions have dealt with the fact that people ignore signs when there is no enforcement. They also ignore signs when there is enforcement. With new projects coming to the park which include 35 acres of new native planting, ultimately the free range for dog aspects are going to be curtailed in accordance with the law. But not yet. The Dog Beach in Ocean Beach and the one at Fiesta Island are highly advertised as leash-free Beach parks, but otherwise, the fine print is pretty clear. Dogs and people are not welcome at the same time on city beaches when they want to be there. These restrictions do not apply to service animals, as defined by the Federal Americans with Disabilities Act (ADA). Part of the problem, of course, is getting the Animal Control forces out to the beach to see what is going on. Most of their efforts are driven by specific complaints. County Animal Control will be invited to a meeting of the Sunset Cliffs Advisory Council soon to present their action plan. If you walk your dog in Sunset Cliffs Natural Park, be prepared to know the law. By the time everyone is done with the Sunset Cliffs NATURAL Park the name will have to be changed. After banning dogs and putting in cute trails with wood posts and rope and benches and little plaques describing the plants, the word NATURAL will have to be changed. Sunset Cliffs ARTIFICIAL Park might be better. I’ve watched this effort to do something with this piece of land for many years and the big problem of erosion has never been solved and won’t be any time soon. Why can’t we just leave this as a natural piece of land to be enjoyed as it is, which was the main reason, historically, for creating parks? Regardless of all that, there will be little natural park or artificial park left if something isn’t done about the drainage from the university. But, hell, it’s more important to worry about dogs isn’t it? Sure let’s put up some signs like that and encourage everyone to report others to the authorities. Hmmm, seems to me this kind of thing has been done before… That’s not the kind of society I want to live in. Report a real crime like robbery or assault, sure, but reporting someone walking a dog, horrors, off of a leash? What’s next? As the owner of 3 small dogs (who have been attacked by a large, unleashed dog in the past and are now fearful and aggressive themselves), NOTHING irritates me more than seeing slobs walking around without their dogs restrained on a leash. Maybe the answer *IS* issuing tickets with STIFF fines to these obnoxiously entitled people, for ignoring the law. These are also the sort who refuse to pick up after their dogs, as well. First, let me say I’m sorry to hear that your dog(s) were attacked by another dog, no dog owner wants to go through that. However, that said, you are unfairly demonizing all people who walk their dogs off leash by calling them slobs and implying that these people don’t clean up after their dogs. I personally take offense at that. I don’t consider myself a slob and I always pick up after my dog. I have seen many other people walking dogs off leash that did not strike me as slobs whom I have observed picking up after their dogs. The answer is not to use a sledge hammer and smash everyone in order to strike those few who are causing a problem. It is easy, lazy, and less confrontational to blanket everyone with a rule rather than go after individuals. There are irresponsible dog owners out there, let’s deal with them directly and not punish the vast majority of dog owners who are nothing like that. I apologize for offending you, Mr. Page. I was still angry, when I wrote what I said, as a neighbor had just recently told ME off, while I was walking my dogs, even though I pick up after them and whatever trash I see strewn around, each and every time I’m out with them. I have seen some dogs off-leash, that are a lot more behaved than mine, but I do think it’s a better idea for everyone to walk their dogs on a leash at all times. That’s alright, I understand how it feels to have your dog attacked, it is an emotional event for a person who loves dogs. My problem with the way the world handles problems like these is that the solutions often penalize the majority in order to deal with the few, or nothing is done at all. That leaves it to the rest of us to “police” those few, and by “police,” I don’t mean calling in law enforcement, I mean confronting people when their behavior is causing a problem. I have personally given people a hard time who have dogs off leash that do not behave, if a dog is not trained well enough to be properly socialized, it should not be off leash except somewhere it won’t encounter others. I have offered plastic bags to people who do not pick up after their dogs. I readily admit this is easier for a man than for most women. But, I think a world where a dog has to always be confined by a house, a yard, or a short leash, is a sad world for a dog. Dogs love to run and explore and socialize. I personally believe that leashes cause many of the problems. Dogs are defensive because their mobility is restricted on a leash and they tend to be more territorial on leashes. Go to Dog Beach or a dog park and anyone can see that dogs get along beautifully off leash. If you read about how dogs react on leashes you will see that they also tend to reflect what the human is doing and feeling. If the human is scared and defensive, the dog senses that and becomes scared and defensive. I’ve had many more encounters with aggressive dogs on leashes than I ever have with dogs off leash. No, the problem is really dog lovers versus people who do not like dogs. If you don’t like dogs then you don’t understand them and what people don’t understand they fear. One of the suggestions here is to ban dogs from the park altogether and I’m guessing that person is not a dog lover. Personally, a park with only human beings walking around in it would be a truly barren place. What next? Well, let’s ban anyone under 25 because we all know how destructive those damn young people can be. Too bad we can’t leash them. Thank you for agreeing with me, OB Dude. OB Dude, a little reading about civil disobedience might be a good idea. Maybe start with the Declaration of Independence. If non-violent resistance is your thing….go for it. Is civil disobedience ok for people that do not wish to comply with building codes? Civil disobedience is for anyone who believes a law is wrong or should be changed as long as they are willing to live with the consequences. It is blind obedience to the law as written, just because it is a law, that is dangerous. Would you have obeyed the Jim Crow laws? They were laws on the books. 1. A motion was made to ask the city to consider placing signs in Sunset Cliffs Natural Park similar to the one displayed here. 2. A second motion was made to table the first motion. 3. According to Robert’s Rules of Order, the second motion is voted first. The second motion passed 9-7-2. Thanks to Lois Lane for reporting on the issue of the possible need for additional dog policy signage which was discussed at the April meeting of the Sunset Cliffs Natural Park Council. 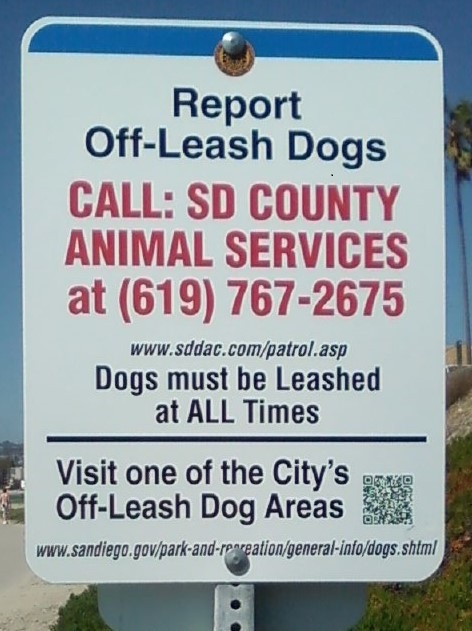 The long established dog policies are consistent throughout the San Diego shoreline parks and have been posted for many years on the six pack signs throughout the coastal areas which are under City jurisdiction. The Park Council opened the topic after receiving numerous complaints about off leash dogs intimidating park users and destroying native habitat. Other shoreline parks are reporting similar problems. The motion was tabled to allow for additional time to research possible solutions. Erosion at Sunset Cliffs, the topic raised by Geoff Page, is of concern to all of us. Fortunately, the City is planning to begin working on Phase One of the Drainage Design in Fiscal Year 2015. If you are interested in giving input, please plan to attend Sunset Cliffs Natural Park Council meetings on the first Monday of every month (with exceptions for holidays) at 6:45 p.m. at the Cabrillo Recreation Center. For additional information, visit http://www.sunsetcliffs.info. There are perhaps lots of crimes going on in Sunset Cliffs Natural Park… How about worrying about gun shots, hit and runs, drug dealing, and the century long history of suicides and people falling off the cliffs?? I was once bit by a dog on the cliffs and know of at least 2 other humans attacked by dogs and 2 dogs attacked by other dogs — so it is a valid concern as well. There are certainly lots of matters to take into consideration to keep the beautiful Sunset Cliffs Natural Park a safe and enjoyable place. A few thoughts….Maybe the park should have rangers? Consider charging for parking (like Del Mar dog beach area) to help pay for maintenance etc. It’s the only park of it’s kind in our area, it’s worth taking care of it for future generations to enjoy. In addition to proper drainage, the park needs to be protected from further destruction. Unfortunately, a few irresponsible dog owners can spoil it for those that restrain their dogs and pick up their dog do do. Maybe prohibiting dogs in the park should be considered. I don’t believe Torrey Pines allows dogs on trails. Also, I frequently see dirt bikes ride on and off trails causing damage. I understand many people have devoted their time, money and energy to improving this park. I thank them for their efforts and support enforcement to keep it a safe place. Thank you Ann Swanson, for your posting on meeting information.